Professor Stephen F. Cohen and his wife, Katrina vanden Heuvel (editor of The Nation) spoke at the First Congregational Church in Berkeley on the evening of February 25th as part of his book tour for the newly released War with Russia? From Putin and Ukraine to Trump and Russiagate, Around 200 people were in the audience for this event, co-sponsored by the local Pacifica radio outlet (KPFA). Cohen spoke first and much of what he said will be familiar to those who have followed his weekly interviews with John Batchelor and his columns in The Nation over the past five years. The thrust of his remarks involved the delineation of how Washington squandered the possibilities that came with the end of the 40-year cold war between the U.S. and the Soviet Union by choosing to take a triumphalist attitude. The decision to take that path has largely been responsible for the dangerous mess we now find ourselves in with the world’s other nuclear superpower. 1918 – 1933 – During this period, the U.S. refused to recognize the Soviet Union and no dialogue occurred between the two powers; however, this cold war was not very dangerous due to the fact that there was no arms race. It ended when president Franklin Roosevelt pursued detente by officially recognizing the Soviet government. 1948 – 1989 – After the WWII alliance, relations broke down and an arms race emerged after the Soviet Union attained nuclear capability. There were periods of detente, the first was between Eisenhower and Khrushchev, followed by Kennedy and Khrushchev, Nixon and Brezhnev, and Reagan and Gorbachev. 2014 on – Cohen stated that he suspected a new cold war was in the making as early as the Clinton administration when Washington a) reneged on its promise to Gorbachev not to expand NATO eastward if he agreed to allow a reunified Germany into the military alliance, and b) attacked Serbia (a close ally of Russia with cultural and ethnic ties). But any doubts were swept away after the Ukraine crisis of 2013-14. Cohen reminded the audience that the 40-year cold war between the U.S. and Russia (Soviet Union) was a negotiated settlement agreed to be in the interests of both parties and that there were no losers. All western leaders at the time acknowledged this fact. But during his re-election campaign, George H.W. Bush claimed that the U.S. had won the cold war and the conflation of the end of the cold war and the subsequent collapse of the Soviet Union began. Cohen pointed out that it was now “axiomatic” and accepted as fact that the U.S. “won” the cold war. He cited the history books that his grandchildren now read in school as perpetuating this falsehood and the dangerous triumphalist attitude that goes along with it. Furthermore, most academic literature apportions blame for the current cold war on Russia, particularly on Putin. By contrast, most serious academic literature apportions blame in a more balanced way for the previous cold war. He also discussed, of course, the media’s dangerous propagating of this misinformation and the blackout on alternative voices in the NYT/WaPo/MSNBC/CNN and, to a lesser degree, The Wall Street Journal and Fox which are both conflicted about Trump. He reiterated that this was one of the things that made this cold war more dangerous than the last one: back then, some debate was allowed in the media and advocates of detente were organized and had a voice. Other conditions that make this cold war more dangerous include the fact that the military divide is now on Russia’s borders instead of Berlin, providing no buffer zone. The proxy wars, such as Ukraine and Syria, are much closer to Russia’s borders rather than somewhere like Africa. Of course, they are very far away from the U.S. Moreover, the zealous political and media project of characterizing Trump as a Russian asset or agent compromises his ability to effectively negotiate a deescalation of any possible military confrontation that may arise from the above mentioned proxy wars or an accident. Cohen believes that in order to end this new cold war, Washington must accept that Russia has major power interests. This translates into no U.S./NATO military bases on Russia’s borders. He also believes that existential cooperation needs to happen, such as a partnership against terrorism. My own thought on this last point is that Washington is not likely to be genuinely interested in going after terrorism when it has such a history of using terrorists to indirectly attack its perceived opponents’ interests. Examples include the use of terrorists in Afghanistan against the Soviet Union in the late 1970’s/early 1980’s and Operation Timber Sycamore in Syria in recent years. But the more general point of actively cooperating on major areas of real interest is well taken. Vanden Heuvel spoke after Cohen. She had a different emphasis with her remarks. One of the first points she made was the toxic effects that “cold wars” have on progressive interests domestically. They narrow the space for dissent, adversely affecting civil liberties and stifling debate on critical issues. They also serve as a self-perpetuating excuse to funnel disproportionate amounts of the budget into “defense,” thereby hobbling the funding of much-needed domestic programs that most Americans want, such as Medicare for All and infrastructure projects. Another point vanden Heuvel made, which was touched on by Cohen, was the very disturbing trend of criminalizing diplomacy. Anyone who has had contacts with Russia is now being cast under suspicion of traitorous intent. First, it was individuals associated with Trump – many of whom are admittedly shady and corrupt in their financial dealings – but the net seems to have been cast so broadly by investigators that actions that were previously considered a normal part of possible diplomacy have been characterized as disloyal. Then it spread to those of Russian nationality who have been studying in the U.S. and networking with like-minded Americans to expand civics projects in Russia. Now Vanden Heuvel recounted the recent experience of a respected independent scholar she knows who specializes in arms control issues who has been asked by the Senate Intelligence Committee to provide all documentation involving his contacts with Russians and travel to Russia. Cohen has made reference to the fact that he and his wife don’t always agree with respect to their analysis of the domestic Russian political scene or the value (or lack thereof) of the Mueller investigation. This became evident in the Q&A portion of the event, with vanden Heuvel a couple of times interjecting probing questions as Cohen was finishing his answer – a sign that she didn’t entirely agree with what he was saying. One of these questions had to do with whether they thought Trump could possibly be a vehicle for peace with Russia. Cohen said that even if we disagree with other things that Trump does, we should support his intent and any actions he may take to deescalate with Russia. Vanden Heuvel made it clear that she didn’t think Trump’s actions indicated he was capable of being a vehicle for peace. She asked Cohen whether he agreed that peace wasn’t just the absence of conflict or the aversion of crisis. Over the President’s Day weekend, I attended my first San Francisco Writer’s Conference. During a short break on the second day, I perused the area where tables were set up in which vendors offered their services and some attending authors had their published books for sale. Imagine my delight when I came across this book by fellow attendee Robert Riggs – especially since I’d just been working on the chapter of my own book involving Alexander II. I immediately plunked down my $20 and started reading it later that night in my room and finished it within a couple of days. I later encountered the author at a session for non-fiction writers. He signed my book and we had a short but interesting discussion on historical Russia. 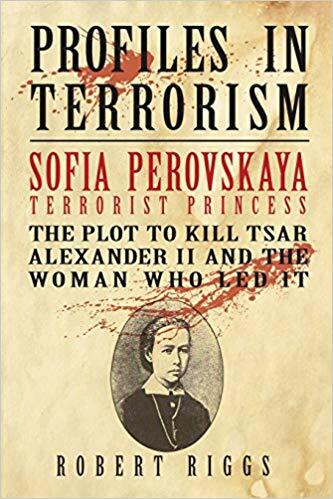 This is actually the first published book in a series Riggs is doing on what terrorists have in common in terms of personality and background, so the emphasis is on how Sofia Perovskaya – who masterminded the assassination of the reformist tsar – fits a profile of a long list of terrorists. Future books planned for the series will cover other perpetrators of political violence such as John Brown, John Wilkes Booth, as well as more recent individuals. By no means poor and oppressed beings, they are generally children of wealth and privilege who go overboard in adopting the cause of others….There is an identifiable constellation of personality traits, what we call here a profile, that is strongly associated with persons who act out as terrorists, regardless of the particular cause or value structure that the terrorist happens to be supporting….Unfortunately, we see that under certain conditions terrorists can “grow” other terrorists by exploiting, cultivating and bringing out its inherent personality attributes, especially among young people. (pp. iii – iv). While I certainly found this thesis fascinating, I was very interested in the historical background provided by Riggs of Russia during the 1860’s and 1870’s, including the revolutionary philosophy that was influential during this time. Riggs gives a detailed outline of the 1863 novel What is to Be Done? by Nikolai Chernyshevsky, which captured the imagination of a segment of restless young revolutionaries. The book illustrated the ideals of a utopian future filled with socialist coops and equality between the sexes. However, it also was interpreted as having oblique references to the necessity of destruction and even suicide to achieve the utopian goal. The novel greatly influenced other writers and revolutionary thinkers, including Mikhail Bakhunin, who in turn, influenced a segment of frustrated reformers and activists such as Perovskaya, a veteran of the largely unsuccessful “peasant movement” that was aimed at raising the consciousness of peasants toward rebellion. Bakhunin and his fellow travelers preached the “necessity of violence for suppressing the privileged classes.” There was no more patience for gradual reforms, consciousness-raising, or non-violent forms of direct action such as strikes, blockades, etc. Bakhunin eventually teamed up with Sergey Nechaev in Switzerland. Nechaev was known for being manipulative and stridently intolerant of those with differing viewpoints. He had fled Russia after engaging in violent activities that had earned him attention from the authorities, including the murder of an early follower who had turned against him. Within the original organization that Perovskaya had been active in, a split emerged between those who advocated terrorism and those who preferred other direct actions along with the continued education and propagandizing of workers and peasants. Perovskaya and her supporters ultimately decided to focus solely on assassinating the tsar. They made several failed attempts that involved the tunneling of areas beneath routes Alexander was supposed to take in his travels around St. Petersburg. They finally achieved their goal on March 1, 1881 with a series of assassins stationed at intervals on the tsar’s route, each armed with a homemade bomb to toss at the imperial carriage. Ironically, word had gotten out shortly before that Alexander had decided on another round of reforms which would have laid the groundwork for a constitution. Some of Perovskaya’s colleagues had voiced misgivings at this point about continuing to pursue regicide, suggesting the possibility of giving the reforms a chance. But Perovskaya’s mind was made up and enough of her colleagues agreed to participate in the plan. After the assassination, police were able to get some of the revolutionaries to turn on others. This, along with surveillance and a sharp investigator, eventually led to the capture of all the perpetrators. After a sensationalist trial, they were all publicly hanged. Although I approached this book primarily with an interest in Russian history of the period, I also found the psychological portrait of Perovskaya and her partners in crime to be compelling. Sunday, March 31st in Albany, CA – Russia and the West: What’s True, Exaggerated and False? Natylie Baldwin is the author of Understanding Russia and U.S.-Russia Relations: A Primer, forthcoming in Spring of 2019. She is also co-author of Ukraine: Zbig’s Grand Chessboard & How the West Was Checkmated. She has traveled to Russia twice, visiting 6 different cities and interviewing a cross-section of Russians on various issues, including their views of Putin, the economy, US-Russia relations, the Yeltsin era, and the Russian Revolution. 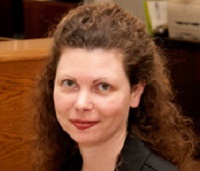 She writes for Consortium News and blogs at natyliesbaldwin.com. “I’m not sure there’s been a better book published this year …. I’m confident there’s not been a more important one.” – Author and activist David Swanson, re Ukraine: Zbig’s Grand Chessboard. . .